Could you go one year without using a mirror? No way. I have a job! And a social life! And a husband! I need to keep this mess in check. 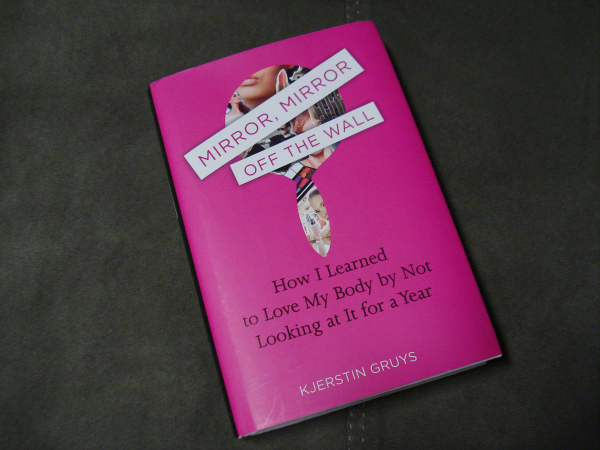 Sociologist-turned-blogger-turned-author Kjerstin Gruys proposed a "fun and adventurous challenge" to bloggers and readers last month on her blog, Mirror, Mirror Off the Wall. The challenge: A Day Without Mirrors. Let me rewind. I heard of Kjerstin back in August 2011 when I read a Yahoo! article about a blogger who committed to a year without mirrors despite her wedding smack dab in the middle of it. I remember thinking, "Wow, that is ballsy. There is no way I could pull that off." Being that she is a sociologist and Ph.D. candidate at UCLA, her blog is a really great real-life application of scientific data. Those who are uncomfortable with the term "feminism" can get a healthy dose of understanding too. It's been just over a year since she completed her one-year challenge, and she penned her experience in a new book Mirror, Mirror Off the Wall (released May 2). Despite my mountain of reading for grad school, I couldn't put this down. I admit that mirrors are used for important things like flossing and driving, but obviously, Kjerstin's project was about appearance and self-esteem. Kjerstin's story reads like a blog post (though much more in-depth, of course) -- like intimate conversation. I could hear her saying those words over coffee with a friend, not just from behind a podium on a stage. This book is a genuine look into an extreme personal experiment, and it is such a bold reminder that looks alone are such a small part of life. If how we feel about our looks brings us down, it's because we're forgetting (or worse, neglecting) what really makes us us. This book also reminded me that while our image woes are the product of many things (our culture, the media, strangers, and ourselves), the discussion shouldn't end with blame. In our personal lives, how can we combat them? How do we determine our own self-worth? What kind of people do we surround ourselves with? I don't have all the answers, but this book definitely has me thinking about these questions in a new light. Bravo to Kjerstin for following through with this idea and sharing it with the world! Tune in on Monday for my Day Without Mirrors (with a photo I'll probably regret posting)! Very interesting. I don't think I could go 5 hours without looking in a mirror. I can't wait to read Monday. Oh wow! I think I need to add that to my reading list! I couldn't imagine a year without mirrors. I can't wait to read about your day without them...maybe I'll try to give it a go too! Eeeep! Wow. I definitely couldn't do that for a year. I'm excited to see how you did for one day! Hmm, sounds like an interesting book! I've added it to my reading list. I think I could probably do the challenge. I've just done a mental recap of my day so far (it's 3pm) and I've used a mirror twice today, and both times it was to do my hair. I could probably brush it without a mirror, it's just habit! Although the second time was after I'd napped and I noticed it was sticking up everywhere... I needed a mirror to know that!